"The way to cook a tenrec," Zakamisy explained as we stomped up through the dripping mist forest, "is to first boil it then peel it to remove the prickles. After that you grill it." Tastes a bit like pig, evidently. The conversation about tenrecs had begun back in Antsiranana, Madagascar, where Zak said he thought he could root one from the underbrush. Not to eat, you understand, just to regard. 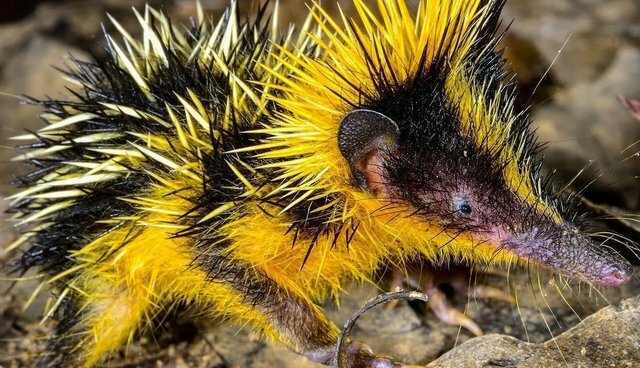 Tenrecs are mammals best described by what they're not: they aren't shrews, platypuses, hedgehogs or guinea pigs, but have something in common with all of these. I couldn't wait to see one. Right then, though, we were heading up a trail to Amber Mountain. The forest was dark, dense and full of things with names like dragon trees, flaming Katys, polka dot plants and outrageous, balletic orchids with tongue twister titles like aerangis, jumellea bulbophyllum and phaius. It all seemed to belong to some remote epoch. In this landscape it wouldn't entirely surprise you to see pterosaurs gliding through the trees and velociraptors sprinting across the trail ahead. But the more we hunted for tenrecs, the more they weren't there. "They're not fady," Zak explained, after another fruitless forage in the soggy leaf litter. "Lemurs are fady, so are chameleons, but not tenrecs. So they get eaten. We had time on our hands, maybe another 10 hours of hard climbing, so it seemed okay to begin yet another conversation about the complexities of Malagasy customs. Zak, you must understand, is not your common sort of guide. His father was a musician fairly famous in northern Madagascar but he died when Zak was quite young. Zak and his six sisters were brought up in a peasant village by his mother and beloved grandfather, who was both a champion bare-knuckle boxer and a storyteller. In his youth the old man had been press-ganged by the French into building the road to the top of Amber Mountain upon which we were walking – though after 50 years of neglect it was a mere precipice-hugging, tangle-foot path. Zak learned French, then English, then Italian and decided growing rice and mangoes wasn't for him. His ambition led him, eventually, to York Pareik who runs a travel outfit named King de la Piste. A piste, in case your French is as lousy as mine, is a dirt road. Zak soon learned the Latin names of almost every Madagascan plant and creature.So now – in his late 20s, with a head full of tribal customs, hundreds (maybe thousands) of traditional stories and a fine grasp of modern ecology – he's a sort of Renaissance man. You ask him a question and you invariably get a very full answer plus peripheral anecdotes. To radically paraphrase his answer, fady is a taboo system so complex that neighbouring villages and even close neighbours don't necessarily share it. Taboos can vary from family to family, community to community or even person to person. Perhaps eating pork is fady, or digging a grave with a spade which does not have a loose handle is fady (not too much contact between the living and the dead). In Imerina area it's fady to hand an egg to someone, it must first be put on the ground. In many areas it's fady to work in the rice fields on Thursdays, or work at all on Tuesdays. Places are also fady, and all over Madagascar you will see trees or rocks lovingly cloaked in bright cloth, or bowls full of money beside certain objects. We even came across a skeleton in a cave with a platter of coins beside its grinning skull. A close relative of fady is vintana, which cuts up time into good times and bad times to do things, which means people might suddenly stop what they're doing and sit down for an hour or two. Some things, though, are generally agreed to be fady, like chameleons and lemurs. Chameleons, from tiny scraps of rainbow to huge, metre-long dragons, are everywhere and, in the forests, lemurs hurtle all over the place or sit and stare at you. Some will even steal your lunch. It's just a pity there's no taboo on slaughtering rain forests – only about 10 per cent of them are left and vast areas of the island are either eroded ruination or rice paddies. Well, there you are. But just then, no tenrecs. Now to the purpose of my trip: I'd come to Madagascar to explore two mountains, one entirely cloaked by some of the surviving rainforest, the other ripped to shreds by water. I was filled, to quote Kipling, with a 'satiable curiosity about an island where almost everything was endemic, volcanic or just plain odd. Any trip necessarily begins in Antananarivo because that's where international flights land. It didn't take me long to realise it wasn't Africa. Antananarivo is a traffic jam clamped round a curious, pointy roofed city surrounded by endless rice paddies. It takes a while to get anywhere, but the people along the roads are charming and mostly beautiful Indo-Malayan or Malayo-Polynesian so it doesn't matter. Coming in from the airport, I just sat and gawped at all the delightful strangeness. But my mountains – Ankarana and Amber Mountain – were in northern Madagascar, so I flew out next day to Antsiranana and King's Lodge. York, who owns the lodge, is seriously laid back. He has a fleet of elderly but serviceable Range Rovers and year-old twins who keep him and his wife, Lydia, awake at night. There was a time, he confessed as we clutched cold Three Horses beers and watched the afternoon sun get swallowed by a volcano, when he wore his hair long, sampled interesting substances and travelled the world in dangerous public transport. Then he found Antsiranana and decided he'd arrived at his Shangri-La. I couldn't argue with him about that. Next day Zak packed up our kit and victuals, loaded up a shy cook named Bridget and set off on the most grimy journey I have ever experienced – and I live in Africa. Madagascar's not dubbed the red island for nothing. When forests are slashed and burned the oxidised laterite soil beneath them is singularly infertile and soon erodes, spreading fine ruddy powder over the whole island. In the rainy season roads are a quagmire; when they're dry each bump produces an effect not unlike hitting a fat bag of bright red flour. When we arrived at the spiky buttresses of Ankarana we were astonishingly red, with our personal colour showing only where dark glasses had been. Each rivulet of sweat made the mess even more surreal and sticky. Well, never mind all that. Let me tell you about Ankarana. On an island of strange things it has to be near the top of the strangeness list. It's a limestone massif sticking abruptly out of the plain and covered in razor-sharp limestone karst pinnacles known locally as tsingy. Instead of going round it, rivers chose to run through it, forming caves, canyons and eerie underground tunnels. You can walk through several hundred kilometres of these things. In places huge caves have collapsed, forming isolated pockets of river-fed forest with sunlight streaming down from above. Creatures live in there you'll find nowhere else on the planet. We hiked through the inky black caves, some with twinkling stalactites and stalagmites, then climbed up the mountain to view the forests and rivers from above. A troop of rare crowned lemurs came to investigate. I bent down to photograph one, and three others jumped on my back to see what I was doing. Fady works wonders in the trust department. We camped at the foot of the tsingy, watched the setting sun turn them orange, and Zak produced some local rum. It was spittingly awful. When I refused to drink it Zak told me a story which seemed to justify getting motherless on bad booze and opened up a later discussion about why the Malagasy are a nation of grave robbers. There was once a mamalava (rum drunkard) who nobody respected. He was around during a famadihana, a time of year when, for some reason or other, corpses are exhumed, their bones dusted off, danced with and carried to some other place (I saw empty graves all over the place). When the skull was unearthed it began to move this way and that. Everyone ran away in fright. But the mamalava took a closer look and saw it was being moved by a little tenrec in the brain cavity.He called everyone back and after that they all approved of his rum habits. "And that," said Zak triumphantly, "is why it's good to drink Malagasy rum!" Next day we headed through more red dust to Amber Mountain. It's a thing apart, a great volcanic massif covered in ancient mist forest with its own wet microclimate quite unlike anywhere else around it. Manokan Ambre, as it's called, towers over the northern tip of Madagascar with, more often than not, a soggy cloud frown across its peak. We overnighted in a very neat, clean hut at Roussettes Forestry Station and hit the trail in a light drizzle at an ungodly 05h00 the next morning. Half an hour after passing an atmospheric little waterfall (sacred, of course) near the hut we were gazing down into the forest-cloaked mouth of a crater lake named Mahasarika. The forest was . . . weird. A glance at the statistics will tell you why. Madagascar has around 10#000 plant species of which about 80 per cent are endemic. It has eight species of baobab whereas the whole of Africa has only one. Of the 258 species of birds, 107 are endemic. Then there are lemurs – 30 species. They're primates which look like monkeys with foxy faces and cat eyes. And tenrecs, which Zak promised. . . .
We hiked past huge panda trees (Pandanus sp), fluffy topped Araliaceae literally dripping with epiphytes, many of them orchids, huge manaries (Dalbergia sp), massive tree ferns (Cyathea sp) and spooky dragon trees (Dracaena sp). A turkey sized Madagascar crested ibis, the bane of tenrecs and chameleons, scratched in the understory, a monticole played hide and seek in the upper branches of a manary and Madagascar bee-eaters buzzed through the mist-edged glades. Lurid lichens sprouted from the rotting trunks of trees thrown down by the area's violent cyclones and in the stream beds Boophis frogs muttered contentedly. The place was simply glorious, and we had it all to ourselves. Around five hours deep we came upon a moody crater lake which appeared suddenly as we stepped out of the forest onto its grassy apron. From there it was a slippery, tough climb out the crater and up to the summit, marked by a neat concrete pillar and a plaque with the words Pic D'Ambre. My GPS registered an elevation of 1#488 metres and, in case you like exact locations, it read S12º35.778, E43º09.188. In the swirling mist we couldn't see a thing. Nearly an hour later, after we'd munched the scrambled-egg sandwiches and fruit Bridget had prepared, the murk suddenly lifted. Below us was a great crater – I think it was the one named Renard – and beyond that the Mozambique Channel. There's just something about the view from the highest point of anywhere that makes it worth the pain. Twelve hours after starting we were back in the hut. My feet hurt and I was suffering from the strange emptiness I often feel after climbing a mountain. Maybe I looked glum. Zak, ever perceptive, handed me a glass of rum and said: "Would you like me to tell you a story?" He gave me no time to reply. "There were once three friends, bon? A duck, a chicken and a dog. They lived together in a village. Once every week they'd take the taxi-brousse to the market in Antsiranana. But one week, when they were half way to market, the taxi driver he told them that because of the cost of gaz-oelie the fare had gone up from 300 francs to 500 francs. "The duck he had the extra cash, the dog was rich anyway, but the chicken he had only 300 francs. So when they arrived in the market the duck got off and paid 500 francs. The chicken paid 300 and told the driver that his friend, the dog, would pay the rest. The dog had a 1 000-frank note. The driver took it, got in the taxi-brousse and just drove off. "That is why, today, when you see a duck in the road it's not worried about the car, the chicken always runs away shouting and flapping and the dog he chases the car going 'woa, woa woa'. . . ."
"Are you feeling okay now?" Zak asked, looking at me with his wise, serious eyes all etched about with smile wrinkles. "Yes, sure. Fierce rum, though. Do you think if I drank it I could spot a tenrec?" "Well, we could try. . . ."